DALLAS - Today, Texas Lt. Governor Dan Patrick announced committee assignments for the 86th Session of the Texas Legislature which opened Tuesday, January 8, 2019. State Senator Royce West (D-Dallas) was appointed to serve on Senate Finance, Education, Higher Education and Transportation committees. He returns as Vice Chairman of the Senate Higher Education Committee and will serve for the first time on Senate Transportation. "My appreciation goes to the Lt. Governor who basically honored my selection of committee assignments made at his invitation to all senators," said Senator West. "Appointments to such key committees as finance and education help me to better serve the citizens of Dallas County and to be a voice for under-represented communities across Texas. "And anything that I can do to guide more resources and students to Texas colleges and universities will be helped by my role on the Senate Higher Education Committee," Senator West added. 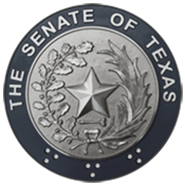 In both the Senate and Texas House of Representatives, appointments to serve on committees are for the Regular and all Called Special Sessions of the Legislature and extend through the interim period between biennial regular legislative sessions. For more information, please contact Kelvin Bass at 512-463-0123.